There are times when you find some sort of solace in eating a lunch that time traveled from 1981 onto your plate and Eisenberg's is where you'd go when seeking that solace. It's usually loud, crowded, slightly dingy, and definitely old. Cramped with red vinyl stools and small rickety Formica-topped tables, it's a diner straight out of the French Connection. A recent trip to the 2nd Avenue Deli proved that NY delis, in the traditional sense, are far from cheap. Eisenberg's bucks the trend. Lunch here shouldn't pass $20, though while you'll still leave full, you probably won't need doggy bags for the remaining three-quarters of your sandwich. 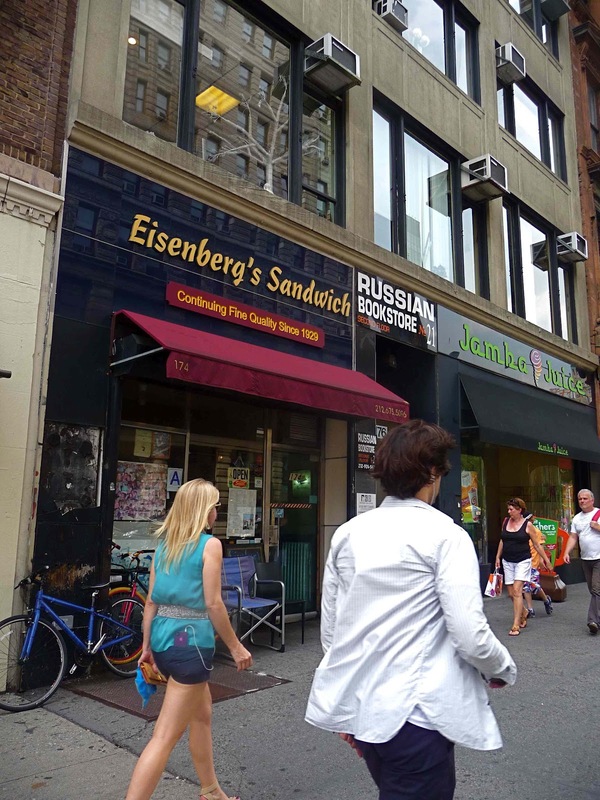 A handful of meals here have left me with a sense that Eisenberg's will never be the 2nd Avenue Deli or Katz's, but it won't be going away anytime soon either. First, the soups. What is it with NY delis and borscht? The only way I'd eat borscht is if my great Aunt made it, and only then because she'd insist that it was an old country recipe that her mother gave her. Not because it tasted good. I'd eat it out of guilt is what I'm saying. So I tried the Chicken Noodle Soup and the Matzo Ball Soup. By the way, the only difference between the two is that the matzo ball soup has a big matzo ball in it. So consider it one soup, basically. Good, but a wee bit salty. The matzo ball was firm without being a brick and the egg noodles were nice and teeny. They didn't go berserk adding a million vegetables. They kept it relatively vitamin free, like any NY noodle soup should be. Noodles, spice, some white-meat chicken, and a wayward carrot and piece of celery that got lost on the way to the pot pie. Once upon a time (last year) NY Magazine named Eisenberg's Tuna Melt the best tuna melt in New York City. Maybe they were in a different New York City. It wasn't bad but it wasn't any better than I could make at home and it wasn't anything I'd order again. 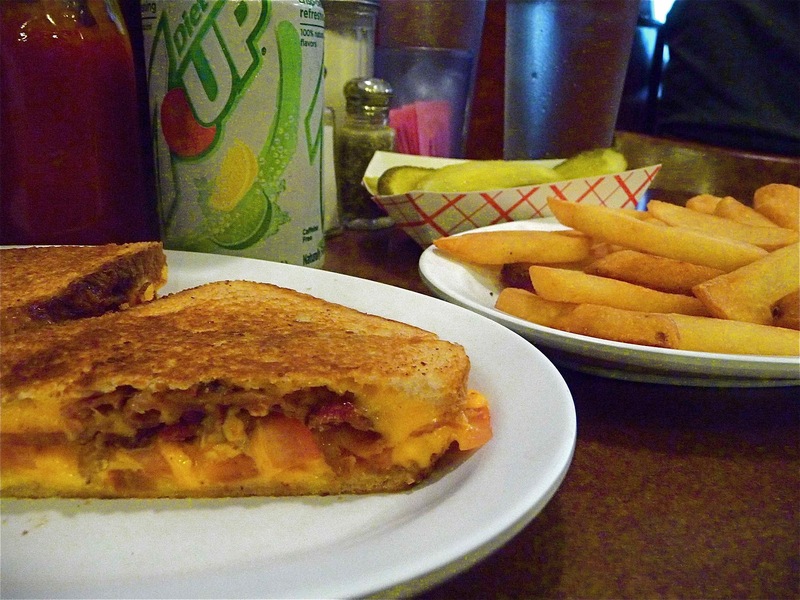 On the other hand, I've also ordered their Grilled Cheese Sandwich with bacon and tomato, which was heaven. You can't get that at the 2nd Avenue Deli, I can promise you. Naturally, I also ordered a Roast Beef Sandwich. Tasty and filling, but not filed seventy-five feet high. It's a more normal size for human consumption. Their Cheeseburger was a cheeseburger and their French Fries are the big thick steak fry kind that I prefer, but you might like the crispier small type. And don't forget to order an Egg Creme for chrissake! 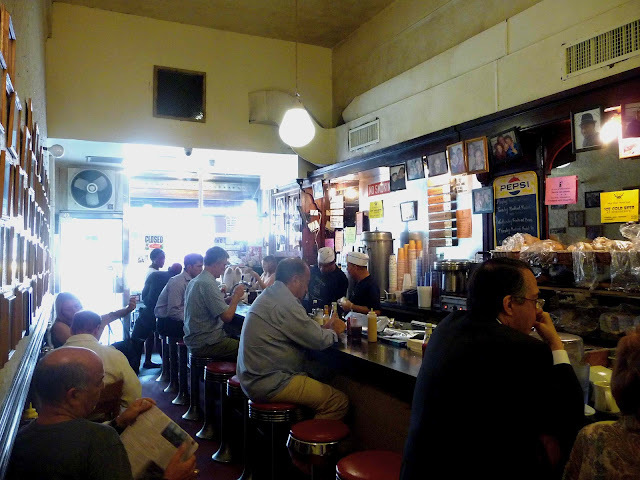 The service at Eisenberg's varies depending on whether you get a table or sit at the counter. If you sit at the counter, expect it to be spotty. The chefs run around taking orders from everyone in the restaurant. On more than one occasion I thought I was being completely ignored only to have my food appear in front of me as if by magic. Other times I was actually being ignored. The waitresses were very nice and you can basically sit here all day if you wanted to (I blueprinted a bathroom I was renovating). As I said, if you enter with a twenty, you'll leave with change. Sandwiches are almost all under $10. My most recent meal was a diet 7up, a side of fries, and the awesome grilled cheese sandwich that you should be eating right now. Total with tip was $16.